We’ve had so many customers send us comments of appreciation that we had to make a completely new page to hold them all! my name is jerry r, i live in north texas recently i purchased your sparrow trap.the sparrows were running off my blue birds and my martins i tried everything nothing seemed to work. the first day i set your trap up we caught 7 of the little buggers i was amazed.the second day we caught 11 sparrows and 1starling,by the third day we had caught a total of 27of the little pests.my hat is off to you sir for designing such a smart device.my martins and blue birds are back and thriving again,they thank you very much. Hi, I started using the trap a couple of weeks ago. It's working great. First day I caught two English sparrows, a female cardinal and a house finch. Since then nothing but English sparrows. I probably have caught 40 or 50 since, sometimes 12 -15 a day. The population is really down, I'm only getting 1 or 2 a day now. I have a bluebird pair that raised one brood and looks like they are back now to raise a second. All the bluebird boxes that I cleaned out the sparrow nests from are staying vacant. (The sparrows used to come back as soon as I cleaned them out.) I look forward to more bluebirds soon. This is one product that works better than advertised. Thanks. Bob B Just a quick note from North Texas to add to your large collection of glowing reviews. The trap works amazingly. I had 5 the second day, the same ones that I have been trying to deal with for weeks now. Thanks for a quality product. I used corn, by the way, which did the trick. I bought your trap a few months ago and use it off and on, primarily after a new hatch. I set it under some prickly ash on a piece of plywood that is on top of 6-8 pallets. Sprinkle some millet around and on/in the trap and let it go. We've caught as many as 47 house sparrows in one day. It works great. thanks. Tom S - milltown wi Blaine – It took a few weeks, but I finally found the proper location of my sparrow trap back in early May. I caught my first HOSP on 5/22/07. As of yesterday, 7/22/07, I’ve caught a total of 61 HOSP (54 female, 7 male). WOW!! On average, I catch one Bluebird Killer every day, and expect this average to improve slightly over time. I keep 1 to 3 males in the trap as decoys, with a couple of tuna cans filled with fresh water, a few feathers, and plenty of millet spread around the bottom of the cage. A little post script…I just caught 2 more female HOSP while sending the previous email. Absolutely amazing! What a great product! It arrived on Thursday and I set it up that afternoon. Nothing happened. I was just starting to worry, and then caught 12 today (Saturday)!! (And one of my neighbors wondered if I really had a sparrow problem!) Wait until he hears this! Thank you for creating such a great trap. I can't wait until some of my 'good birds' can start nesting in my birdhouses without being evicted or having their eggs destroyed by HS. I recieved the trap wednesday. Baited with millet on thursday. Trapped the first hosp on Friday a.m.! Thanks for the quick service and good trap. How clever you are to make those traps! It is so sturdy. The day I received the trap, I set it on the ground next to our house where those awful birds settle at night. I baited with raisin bran and bread crumbs. In the morning I had four birds. My husband said to ask you "Where do you want us to send them." Ha ha. Thanks for the trap and such quick shipping. Those birds ran our bluebirds and swallows out of ALL of the houses I put up. hi uncle blaine ,you have my permission and hope that you will put this on the web page: I have caught the majority of the HOSP in my backyard within a few short weeks. I have never before had any other birds there except HOSP. But now that i have captured so many of them, i can finally see the finches, towhees and tons of juncos feeding on my feeders without any annoying sparrows to harrass them while they feed. Now, when i walk out to the car in the morning, i no longer hear that obnoxious, monotonous chirp from HOSPs. instead i can finally hear the beautiful songs of our native birds that deserve to be singing in the morning sun. Thank you so much for this incredible trap. i am absolutely amazed by its quality! Just to let you know that the trap arrived in perfect condition. Put it out back that very day to let them get used to it.Put millet and water in it a few days later as you advised. Trapped three the first day. Five the second. Three again today, with one decoy in place for tomorrow. Can almost hear the cardinals and chickadees cheering. Thank you, Mr. Johnson. Blaine , The traps came in great shape and I put them out right away. For two days, nothing! Then, things started to happen. I have caught 54 sparrows since I got them!!! Most are young of the year, but, there have been enough older, breeders that the tree swallows have taken over the low nest boxes again. Your trap design is the most ingenious that I have ever seen. And that works so very well. I will certainly tell others about it as it is was certainly a worthwhile investment. Thanks! Ken E.
Hey Uncle Blaine, Just wanted to update you. The Tree Swallows actually fledged this year! First time in four years. The House Sparrows killed the young the past 3 years in a row. That's when I purchased your trap. Now that I've removed the Sparrows, I have many more native birds than I have seen in the past. After the Tree Swallows finished with the nest box a House Wren moved in and made it home. I very rarely ever see Sparrows anymore. The trap is on the shelf until I need it again. I am enjoying the Sparrow free summer. Thanks again. Within 4 days of receipt of the trap I have caught 7 sparrows. It really works and you have a great design. All I did was put feed around the trap and we left food and water and left home for 4 days (not intentional). When we returned there was 7 in the trap. Hi Blaine, Just an update. Have trapped over 100. Has dropped off the last couple of weeks. Blaine ... thanks for below. 9 sparrows caught yesterday.... 8 more today...(Mon). More fun watching the trap than watching football!. Blaine , My trap arrived yesterday and by sundown I had trapped 6 of the little SOBs!! I placed the trap a few feet from my birdfeeder. I had to put a little cracked corn on the perch platform and that did the trick! I'm looking forward to getting rid of most of the several hundred sparrows that have plagued my feeder. Thanks for you help. Blaine , you are a saint for developing your deluxe repeating HOSP trap. We caught about 30 HOSP last fall using your trap and suggestions. Hi Blaine, thanks to you and all the Blue-birdsters who recommended your repeating HOSP trap to me! It is FABULOUS! Things have been a little bit slower in August but today we did manage to break 502 Hosp for the season. Deb broke it down and figures we were open for business on 74 days since starting on May 19th. That comes out to 6.8 HOSPS a day. Update on my trap. It took about 10 days of moving it around before I started catching HS as they were kind of scarce lately...I got 9 in 4 days last week, and then put it away over the weekend as I was out of town. Will get it back out there catching this week...thanks again it does work! I can't believe that you sent my shipment out already. That is AMAZING !!! I have never had anyone send out an order that fast and I order a lot on the internet. Thank you very much for the fast service. You are the BEST! I placed the trap on top of a 30 gal. garbage can turned upside down, to keep it off the ground, and the first day I had 12 sparrows. Again thanks for a great product. 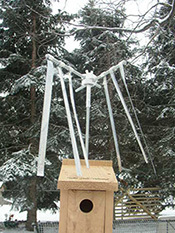 Received your trap via Fed Ex ground on Saturday and performed the simply assembly and placed outside on ground close to bush that the sparrows flock in that is approximately 8 feet from platform feeder. 24 hours later no birds. Moved trap 4 feet closer to feeder (within area that the seeds fall from feeder) and currently I am catching a dozen per day. It must be like the restaurant business - location, location, location. If somebody is not catching the pest try moving the trap. Cannot believe 4 feet made that big of difference. I love my trap so much that now my Dad wants one! First, the trap works great! The first afternoon my husband set it up, he caught 8 sparrows. He left 2 in for decoys & has caught over 30 in about 6 days. Things have been slowing down here. I missed a week out of the last 30 days and I have been lucky to get 3 or 4 HOSPS some days. I finally had some better days and I broke 603 HOSPS. Awesome product!! caught 9 the first 12 hours wish all ebay items were this good! I've used one of your traps before. My sister bought one from you for my mom's birthday, and my mom loaned it to me for a sparrow problem I was having. It works much better than the one she bought from the PMCA. Blaine - I received the trap late last week. Great design! I set the trap out under a birdfeeder I was using specifically to attack the sparrows to a certain area. They would go to the feeder but not the trap. After two days, I removed the birdfeeder and within an hour I had trapped my first house sparrow. I caught five that first day. In all, I've caught 17 house sparrows in 5 days (almost a 50/50 split of males and females)! I did catch one chipping sparrow which I immediately set free. Before I discovered your trap I was at the end of my rope thinking that I should just remove my nest boxes and realize that I would no longer have bluebirds and tree swallows nesting in my yard/fields. Now I am waiting the return of these species in hopes to once again see nestling's fledge. Thank you. Blaine , By golly what can I say you haven't heard before! I hope you sell a million of these damn things. I posted positive feedback for you, the least I could do. You made a crow trap yet? You put one together that works like the 'Come to Jesus sparrow trap' I want to be first on the list to purchase one. I just wanted to let you know that your traps are great. I received them last week. It took about a week to get one and in the last forty eight hours we have caught 9 more. Thanks. Hi Blaine , Can’t begin to tell you how pleased I am with your trap. Received it Saturday, set it up last night, caught my first male HOSP today. Should’ve done this before my bluebirds laid their eggs, as he destroyed all of them last week. I remain hopeful, however, that now that I can catch & get rid of the HOSP, I will someday have a safe bluebird family. Thanks again. You won't believe this...maybe you will and if this helps please use this just withhold my name, please. I went to get a nest from the bb box on my front porch where the sparrows already had a nest. A sparrow flew away as I went to the bb box. Inside were feathers and half of a nest. I thought maybe it was baby sparrows (if so it'd be 2nd hatchlings this year!) Pulled it out and there was a blue bird with head bloodied. She ? is still alive but don't know if will survive. Definitely going to fit trapping sparrows in my schedule even if it means less sleep now! Quick shipping. Well engineered and constructed trap. Works well! Received the trap on Saturday. Trapped 10 on Sunday and 5 more today. Thanks! 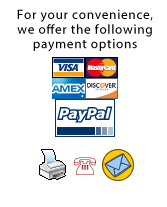 fast, fast, fast shipping!!!!!!!!!!!! Great trap!!!!!!! best I have ever used. Just wanted to let you know the trap arrived as promised in perfect working order. I trapped over a dozen sparrows in the first 3 days. 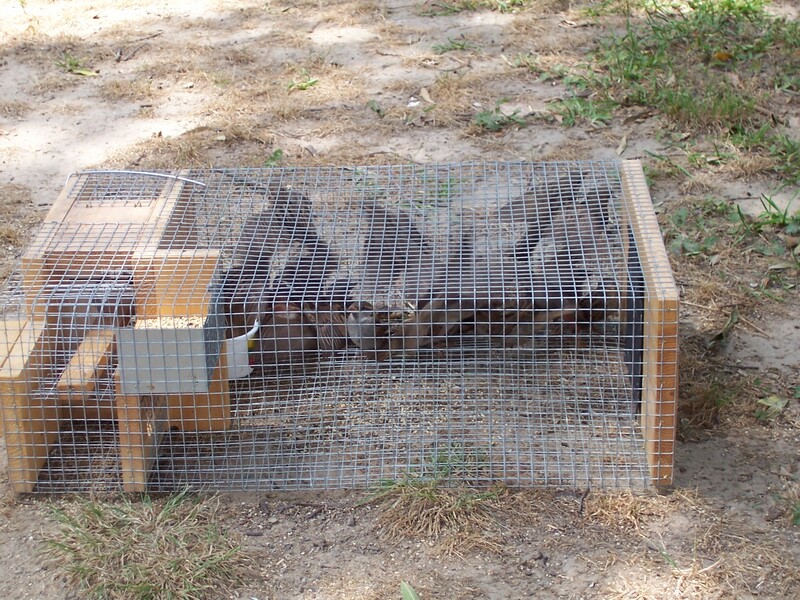 The trap is so easy to use and maintain it will be simple to continue trapping on a year round basis, which will benefit my purple martin colony and all other native birds nesting on my property. Thanks, Peg R.
GREAT TRAP!!!! !There seven less sparrows in my yard. Great Seller! Blaine , I am still trapping HOSP with your deluxe repeating HOSP trap! Since the cold weather has set in, I've trapped an additional 9 HOSP. That brings the total up to 24, and by my reckoning, there were 25-30 in that flock that invaded my back yard. Awesome! I may leave it up all winter! Very fast shipping. Sparrow trap is high quality with excellent instructions! Caught 2 sparrows the first day, in the first 2 hours, the other male sparrow is smarter than the average bear, but his days are numbered to, thanks a lot the trap works excellent. Received the Sparrow trap today and had 5 Sparrows the first hour. We should have one of these traps in everyone's back yard and soon we would be rid of these pesky critters. Very satisfied with mine. WOW! That trap you sold me is incredible! It’s only been out of the box a half a day and I already have a dozen sparrows. THANK YOU!!! THIS TRAP WORKS GREAT!!! Seller was fast and packed excellent. I received your trap yesterday. Thank you for the very fast shipping! Put it out this morning. I used some cat food for bait since I didn't have any millet handy.......and..... the sparrows have been helping themselves to my cat's food in the barn. It is noon.......and I have already caught four sparrows! Thanks much for a great product! Lightning fast shipping. Great advice. Caught 6 little buggers the first day! A+. Again, thanks for the terrific trap and the guidance to use it properly. You're doing well on sales, I glad to see that. Before last year, I would see whole flocks of 23 house sparrows on the lines outside my window. After a year of use, the sparrow flocks that plagued my area were simply gone. I'm still in awe at the results. Uncle Blaine, I received your trap. I set your trap and I caught three sparrows the first day. Thank you very much. It was exactly what I expected it to be. I have almost all of the kinds of trap out right now and I think this is the best one. Thank you for the speedy delivery of the sparrow trap last week. My 20 stall horse barn had been taken over by thousands of sparrows and were making a mess of everything. I baited the trap with the white millet and put it in an elevated area of the barn. It took about a week for the sparrows to stop avoiding the trap. Well then once one bird when in and got trapped, I ended up with about thirty sparrows in five hours. I was very happy with the success. Now for four days now I have been putting a dent in the population of sparrows at my barn. I also made the local Environmental Center happy because they are using the sparrows to feed the captive hanks and owls. Win, win for everybody.. 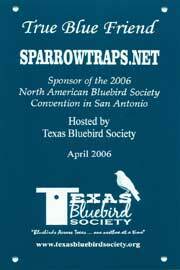 The Texas Bluebird Society sent the plaque at left in recognition of Sparrowtraps.net’s sponsorship of the 2006 North American Bluebird Society Convention.